I’m a die-hard pepperoni fan — my favorite pizzas are topped with loads and loads of pepperoni. But as I become more conscious of what I’m eating, I find that some of the foods I enjoy are rather scary when you look at the ingredient list. Pepperoni is one of those and frankly, the pouch stuff isn’t that great. I didn’t really know what to do about it though. Making it hadn’t really occurred to me. One day my husband looked at some bag of pepperoni in the store and showed me the mile-long ingredient list full of stuff I could barely pronounce, then asked me why it was we hadn’t made it yet. I shrugged and said I’d look for a recipe when we got home. 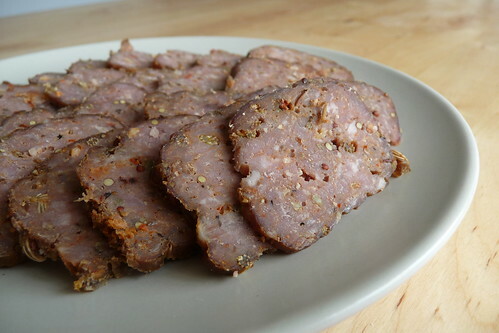 As to why I used a mix of meats… Traditionally, pepperoni is cured pork. 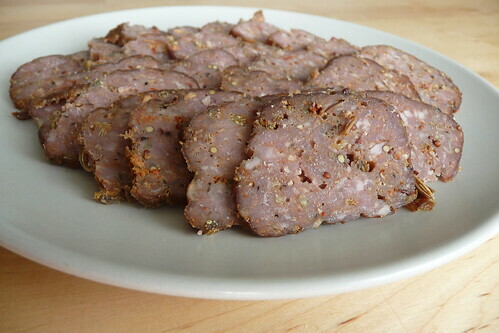 Kosher (halal) pepperoni is cured beef. I had a bit of each. I would wager that since Hormel sells turkey pepperoni that you could do it with turkey or even chicken, but I don’t know what the oven timing would be. If preserving the color is necessary for you, invest in some Morton Tender Quick Curing Salt, which is a mix of sugar, salt, potassium nitrite and potassium nitrate. I’ve found it at exactly one store in Salt Lake – Southeast Asian Market – where it was quite pricey for a 2 lb bag that I felt I’d probably never use up. Instead, I figured that since I would be freezing the leftovers and don’t care about color preservation that leaving out the preservatives would not be a big deal. This is definitely a make-ahead recipe but very, very easy. Active time is probably 10 minutes, for all that the recipe takes three to four days to complete. It comes out very dense, very spicy and a very reasonable facsimile of pepperoni. It’s close enough for me, at any rate. I recommend starting this recipe on a Thursday and cooking on Saturday or Sunday. Mix all ingredients together thoroughly, making sure to knead the spices evenly throughout. Wrap in plastic wrap and let it rest in the fridge for two or three days4. On baking day, remove the meat from the plastic and form into a nice 2″ thick log. Place it on a rack set into a rimmed cookie sheet and then into the oven5. Turn the oven to 200°. Turn the meat every two hours and cook for about 7 to 8 hours until it is dry and firm. Remove from the oven and pat off the excess grease and fat on the surface. Let it cool then slice thinly. Store in the fridge or freezer. Or regular, if you don’t have smoked. Omit for less spice or substitute cayenne pepper. This is to replace the curing salt and balance the spiciness. Don’t try this with meat that says “Use or Freeze by Yesterday” – do this with meat that can stand to be in the fridge a few days without spoiling which is anything fresh or frozen while fresh. 4a. And if you’re doing this from frozen ground meat, do your hands a favor and let it thaw completely. We want lots of airflow since the idea of this is to dry it out – letting it sit in its own fat is not helpful in achieving this goal. This entry was posted in american, beef, dairy-free, gluten-free, ground meat, pork, recipes, snack, untranslated. Bookmark the permalink.